Few Buddhist masters have had as extensive an impact on the Buddhist world at large than Geshe Kelsang Gyatso. With over 1,100 Buddhist centers (and growing) across both the Eastern and Western hemispheres, Geshe Kelsang Gyatso has brought the Dharma to places which may otherwise never have exposure to Buddhism. Geshe Kelsang Gyatso is one of the last Greats, that last generation of immaculate teachers, scholars and monks who left Tibet and brought with him the perfect lineage of teachings that are being upheld today. Ordained since the young age of 8, Geshe-la studied for many years under the father of all Lamas today, H.H. Kyabje Trijang Rinpoche, before he eventually left Tibet to live in India among the exiled Tibetan community. Living in exile never deterred him from his practice and spiritual determination. Having brought only two Buddhist scriptures with him during his escape Geshe-la endured the hardships of a new country to settle into his monastery, where he taught and did retreats for 18 long years. Under the guidance of His Holiness the 14th Dalai Lama, Lama Yeshe – another of the greatest pioneering Buddhist teachers in the West – invited Geshela to join him in England to teach. Again, he would start a new life in a completely foreign land, teaching in a place and to a people who were only beginning to know the existence Buddhism. Against all odds, Geshe-la has built the New Kadampa Tradition (NKT) organisation to what it is today – a spiritual institution that has centers in every major city in the world, that publishes thousands of books of his teachings and that only continues to grow. 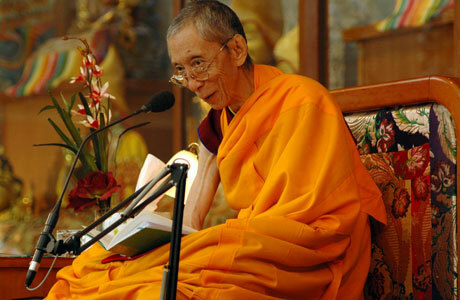 Geshe-la maintains the perfect lineage as passed to him by his own teacher, Kyabje Trijang Rinpoche. His centers throughout the world promote and uphold the most sacred teachings of the Gelug lineage – Tsongkhapa, Vajrayogini and Dorje Shugden. By his tireless efforts in bringing these practices to the world to help beings everywhere, he is now the most widely-known Gelugpa Lama in the world, second only to the Dalai Lama and the Panchen Lama. Bookstores throughout the world carry his books and thousands of people from all over flock to the NKT headquarters in the Lake District, England to attend their globally famous summer festival and teachings each year. While there are many Lamas all around the world creating tremendous change, few have reached out to as many people from as many countries, backgrounds and cultures as Geshe-la has. At www.dorjeshugden.com, we rejoice in his continuous and enormous contribution to making Dharma so widely accepted in the world today. From a single Geshe from Tibet, thousands of practitioners, monks, nuns, scholars and Dharma teachers have emerged; further, tens of thousands of students have also been introduced into the authentic Buddhist lineage, studying at introductory, intermediate and advanced levels. We celebrate the thousands more students now and in the future who are being introduced to Dharma through Geshe-la’s extensive study programs and the beautiful Sangha that flourish throughout his organisation. the wheel of Dharma and benefiting countless beings. This is the first of the many tributes of Dorje Shugden lamas that we at dorjeshugden.com will be offering. Ven. Geshe Kelsang Gyatso is the first. We will do similar tributes in the near future, with dedications for the long life of these great lamas. We invite any information, background, history, pictures, memoirs, etc of lamas who are champions of our lineage. Please leave your ideas, thoughts, pictures etc in the comments section below. Admin: We are sure that Geshela has had a tremendous and deep impact on thousands of practitioners everywhere. If you have had any experiences or wish to exchange any thoughts about Geshela, we invite you to please share them with everyone here – either in writings or pictures. We would love to hear your experiences and celebrate in what you have to share. Many people would be inspired to hear your views, thoughts, sharings and perhaps encounters with this great 21st century Master of Sutra and Tantra. Please take note that the comments section is able to accept pictures and links to videos as well as text. This entry was posted on Monday, February 13th, 2012 at 12:31 pm	and is filed under Tributes. You can follow any responses to this entry through the RSS 2.0 feed. You can leave a response, or trackback from your own site. I have all your books, and have received many empowerments and teachongs from you, met your sister, nephew, your other family members, thanks to you I also went on to meet and receive teachings, empowerments, advice from Gonsar Rinpoche, Trijang Chogtrul Rinpoche, Rabten Rinpoche, Lama Gangchen, Zawa Rinpoche, since I’ve been living in Shanghai since 2004, I’ve met Lamas of all traditions of Vajrayana: Nyingma, Kagyu, Jonang, Sakya & Gelug, I’ve exercised discretion when discussing my Buddhist practice.